Qingdao Haier Group, simply known as Haier, was founded in 1984 to supply refrigerators throughout China. In its current state, Haier sells home appliances throughout the world. The company produces many various products from televisions to air conditioners, though one of their biggest sellers remains home appliances. The Haier brand is committed to social responsibility and energy efficiency for their products. While the Haier brand is made to last, even the best appliances can sometimes break. Instead of trusting in generic service centers, call Action Appliance Repair. Our family-owned and operated business was founded in 1961 and continues to stand firm in our belief that customers come first. We ensure all customers are taken care of and are proud that our clients return to Action Appliance Repair again and again for their service needs. Our technicians are experts at what they do and have more than 50 years of experience working on quality brands such as Haier. Some service centers offer basic knowledge of the product. Here at Action Appliance Repair, we know everything about the products we service. The next time your Haier appliance needs repair or maintenance then call us toll free at 866-611-4479. 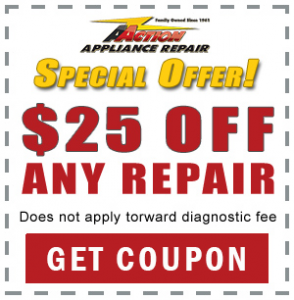 Here at Action Appliance Repair, we make sure that you get the best service and price in town. Your service call is absolutely free with each repair we make. When your Haier appliance fails to meet your standards then call Action Appliance Repair for work you can trust. We specialize in Haier appliances and can be trusted to fix your machine like new again. Along with our team of trusted, professional repair technicians, we also offer our customers a 5 year pro-rated parts warranty. So what does calling Action Appliance Repair for your Haier appliance mean for you? We waive the fee of our service call if we repair your Haier appliance. You won’t owe us anything if we visit and are able to repair your appliance.